Play It Straight? I Wouldn’t Recommend It! I picked this up at my local supermarket back in March specifically to review for you guys and just never got around to it so decided this weekend was as good a time as any. Before I used it of course I checked for other reviews but surprisingly I found none. I did find several sponsored posts promoting it but nobody that had actually used it… strange, I thought. Because of this I wanted to offer thorough step by step pictures as well as before and afters for those searching for them like I was. My hair is naturally wavy, above is the result of sleeping on it damp. The got2b kit promises smooth sleek, manageable hair which is quicker to dry and leaves natural curls more defined. The Directions say to wash and towel dry your hair and split it in to 4 sections. It’s apparently important not to use metal clips to do this but I don’t know why. You should then smooth the serum on to each section evenly and comb through. The processing time for this stage is 20 minutes, it instructs that you leave your hair down for that time and comb through regularly to keep it straight. Once the time has elapsed rinse thoroughly and again towel dry and section before applying the sealing cream. You need to keep it straight for 10 mins this time, regularly combing through again. Above you can see the condition of my hair after both treatments. In fairness my hair is very straight but it’s absolutely ruined. As I type I have a concoction of Philip Kingsley’s Elasticizer and the Body Shop Shea Oil slathered on my ends and wrapped in plastic in the hope it will save me some inches from the salon shears but I’ve accepted I’ll have to make an appointment very soon. I’m not going to say this is a terrible product but much like the John Frieda Go Blonder range you need to know what you’re putting on your hair. This product contains hydrogen peroxide so the damage you experience will not be dissimilar to that you would when using an at home bleach. For someone with virgin hair that’s coarse, wavy or unruly this would probably work really really well but it IS going to cause damage! 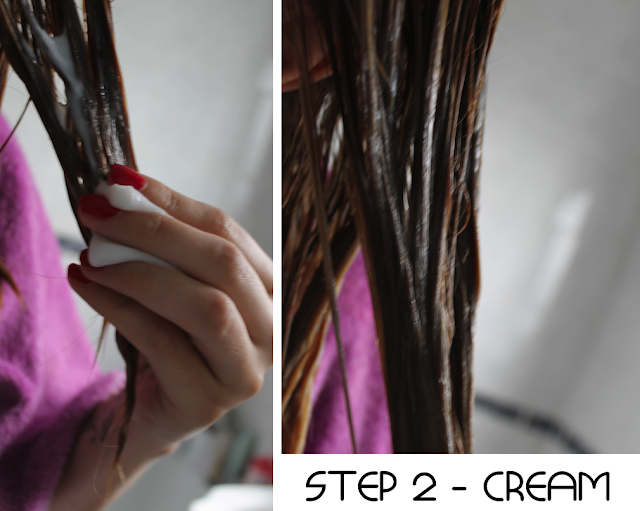 When I bought it I kind of expected more of an at home Brazilian blow dry which some of you may know contains keratin and is a highly nourishing treatment.. this is more of a DIY chemical straightening. I did check the ingredients before use and saw HP listed but I just had no idea how strong it would be. My advice would be if you’re trying to be kind to your hair (like I was) avoid this at all costs but if you’re looking for a super strength straightening system for a bargain price and you think your hair can handle it then this will absolutely do the job. It’s not a conditioning treatment and will not leave it any more manageable but by God it will straighten! This is no longer a blogger blog therefor GFC will no longer pick up my posts. Oh dear, I recommended this to a friend the other day thinking it would be good, luckily she hasn't used it yet so I'll recommend she takes it back! In the Nordic countrys Schwarzkopf has this contest called Hairmonsters where you can win this product… I took a look at the Norwegian facebook-page and many persons have written that this product har ruined their hair… Strange that the comments aren’t deleted. One person said she regretted that she didn’t see the warnings on youtube before using the product, I couldn’t find any warnings. I also noticed that a critical question on yahoo has been removed. Thanks for your warning, it shows the result very well! And I guess the unfortunate people who do try this product ends up as real hairmonsters! haha love this! Hair monsters indeed! My hair was growing so luscious, healthy and long…wasn’t really expecting this to happen at all! My hair practically shrivelled up! every time I touched my head heaps of hair would break off! it’s been a terrible 4 months! Oh nooo! 🙁 I see this advertised on e4 all the time and I was seriously considering buying it. Thank you for this post, you saved my hair! I have used it and ended with the same result damaged coarse hair that no amount of repair products will put right, i also complained to scwarzcopt they sent me the repair products, I have had 3 inches cut off and I only see further cuts until all the damaged bits are gone I wish someone had told me not to use it!!! I used this product and wished I had read your review first! It not only did the same to my hair but I also ended up at A&E after suffering an allergic reaction to something in it – looked like Elephant man! Swollen face, eyes, lips, soft pallet, mouth. Ended up with a cocktail of drugs to help my swollen face – am on day 2 now and a little bit of improvement to my symptoms can now be seen – shame the same can’t be said about my poor hair! oh my god! horrendous! I dont know why there aren’t more reviews but I intend to make a warning video about this soon and I hope you dont mind me showing your comment as I want to show it’s not just me that’s suffered! I'm always scared to do my own hair. I think I'll just stick with the professionals. Thanks for reviewing. regular dye is fine but this was like i'd overprocessed bleach.. just awful! had the ‘play it straight’ pack open and was ready to go…. Just thought to do a quick goggle to check any reviews – I’m so grateful I came across you Miss BB! Product binned! Hair disaster adverted! In the review you do refer positively to Brazilian Blow Drys as ‘highly nourishing’, so maybe I’ll research that option. I look forward to your review on protein treatments. Your hair was stunningly beautiful before and really didn’t need straightening – unlike mine which is frizzy and needs constant taming! It makes me cross when bloggers recommend products they haven't used so thank you, thank you for actually trying it and not reposting a press release. I did consider buying it but like you, I say the HP and backed off, your poor hair. Have you got some keratin treatments to use on it? Elasticizer, I think, is more of moisture treatment and I needed to buy specialist protein products when my former hairdresser ruined my hair with a terrible bleaching. 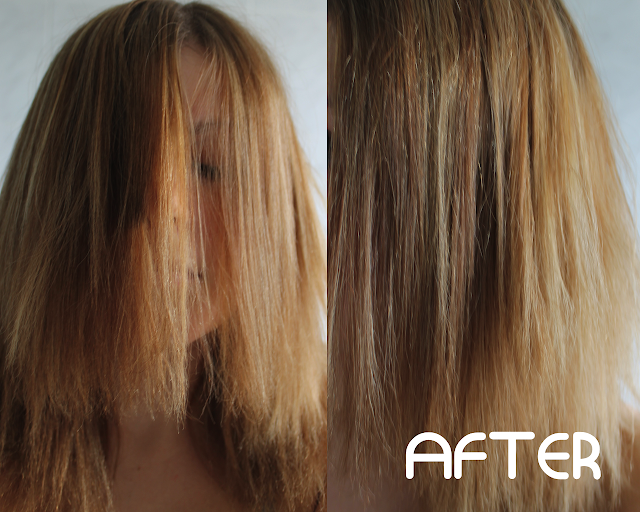 I recommend Joico Intensive Reconstructor and Chi Keratin spray if you feel you need the keratin. honestly, I'd have done the same! A sponsored post is just an advert, none of the girls said 'i've used it, it's amazing' they just promoted that it was available and sounded like a great product which i said in my haul video! i am, however trying to get their ad taken down as i don't feel comfortble promoting this after what happened. Oh my God, you must be furious! Have you emailed the company? i have never heard of this before but i do quite like the company and all their other products!! i have nothing against the company itself but this is horrendous! oh my god thats terrible! hopefully it hasnt caused too much damage to your hair! That is so terrible! You poor thing. I was a little tempted by the Bumble and Bumble version of this… but really I'm far too lazy to bother with the whole process. Thankful I didn't give in! This product worked great for me, but I did not wash it beforehand, and my hair is much thicker/curlier than yours. It is definitely not straight, but I only wanted to loosen up my curls a bit, so I am very happy with this. I feel bad for you though. I think your wavy hair was quite pretty to begin with. Good luck getting it back into shape. it has kept my hair straight so it does work but a product that says it lasts for 10 washes absolutely shouldn't do THIS to your hair! it was far stronger than it made out and my hair was also unwashed before application. I'm disappointed not to have received a response from the company yet! I have just come across your site after searching online for someone who had a similar experience with this product. My hair is just like yours in your pictures and it has been 2 weeks since I used it, i.e. over 10 posts later… What was I thinking of?? I have been trying to grow my hair and it is a nice length but I will have to make an appointment this week to have several inches cut off… Has the company got back to you yet? And thanks for your post! I meant 10 washes not 10 posts! FINALLY! I hate that it ruined your hair but I have found NO other reviews like mine! I’m afraid it’s going to have to be chopped. I cut off a lot and then went back for more ’cause I realised it wasn’t going to grow until I cut out ALL of the damage. You have to make peace with it and move on. The company came back to me and sent me a TON of free products but that’s not bringing my hair back is it? They never explained why it would have damaged my hair so badly so I’m not really satisfied with their response! I’m shocked but then I found so few reviews goos or bad online.. suspiciously few I thought at the time but I guess it’s all down to hair type. Regardless it should have done what it did to mine. i used this product as a treat to myself on my 21st birthday. My hair is in tatters :'(. i would not ever recommend this to anyone. i contacted the company on 19th october(my birthday) on monday i received a hair questiner and a prepayed envelope to send a sample of my hair to. i am currently waiting to here back. not only did it wreck my hair it also turned my hair 2 shades lighter on my highlights. yes!! it has ammonia or peroxide in it for sure.. it’s just not something that should be marketed as it is.. let me know how you get on! I think Schwarzkopf is balantly misleading the customer with the marketing of this product. It’s advertised with words such as ” a serum” and “sealing cream”,which sound like something that conditioners the hair while it makes it less frizzy, and seals the hair and makes it smooth and shiny. They are also feeding the customer a ton of bs by talking something about added keratin and protein etc. In reality the product is a mere straightning perm home kit. 2. they tell you not to use metal combs or hair clips because the perming solution oxidizes metal. 3. “smell something? – it means it works” most of the perming solutions smell foul while in process because of the ammonium thioglycolate. 5. Straightning perms are usually “less permanent” than the curling ones. They usually last only few weeks. 4. and most importantly it’s a perm judging by it’s INCI list. Allthough the straightning perm’s don’t last as long, the chemical process is the same as in curling perms and is based on oxidation and reduction . Which means that the so called “serum” is used to break the protein structure in the hair and the “cream” is used to reform the broken bonds in a new order (straight / curly) . Doesn’t sound too conditioning, huh? The problem with this home straightning thing is that the customer has no idea how strong the perming solution is and can’t know if her/his hair can handle this treatment. Professional hairstylist have usually perming solutions for at least three different hairtypes. 1 – the strongest one that is used for really healthy hair that is in it’s natural state (no color, no former perms) 2. medium for normal colored hair that is in rather good condition 3. the lightest for chemically treated hair that seems to be a bit more in a fraigle condition. There’s just no such thing as a straightning perm solution that magically adapts to all hairtypes , so it’s really fishy that they have only one kind of perming solution. Just to let you know it isn’t the HP that got your hair in a bad condition, (because the hp used in the sealing lotion is never really that strong and the same sealer can be used for all hair types) but it was the way too strong perming solution aka the serum. This product probably works great if you by chance happen to have just the right kind of hairtype for the perming solution of this strenght, but if you don’t it’s goodbye to your beautiful hair. It really pisses me off that Schwarkopf, which is supposed to be one of the leading hair brands in the world and also makes professional dyes, tools etc, can balantly sham customers like this. I don’t know what the consumer protection laws say about this kind of misleading advertisement, but imo they should be advertising the product as it is – a straightning perm – NOT a serum, or it shouldn’t be sold to anyone in the first place. I couldn’t agree more with this and wish more people were talking about it. When I made my complaint they sent me free conditioners etc etc but absolutely no explanation as to why it wrecked my hair and from the sounds of it it’s happening more and more and I’m receiving regular comments and emails about this product now. It makes me so mad that it’s so cheap and girls and picking it up thinking it’s some kind of brazilian blowdry at home when in fact it’s packed full of chemicals! I have bleached my hair at home more times than I can count and never has it been left in this condition! I agree about the bleaching my hair has had some stick and never been in this bad condition! no it’s a very harsh product and chances are you will have to cut off several inches! wow so glad that i read your comments. i was just about to use the play it straight product. i have bleach blonde hair and can only cringe at what could have been!! for the record though and if it is any help to people, I often have brazilan/keratin blow outs and have bought the kit off amazon. I’ve had no problem with the keratin product at all and my hair has always been in miles better condition after a brazillian! I’m from Brazil, but I live in Norway. My hair is really curly as the most of Brazilian girls. I was really happy when I saw it at the supermarket in Norway… My hair is dark brown… Super curly… No colouring…. Nothing!!! That is why I decide to try that product and it works really well. In Brazil we have hundreds of products that promise to make your hair straight …. We always knew that this kind of product doesn’t match with colouring or any kind of quimical. Thank you, you’ve just saved my hair. I have naturally curly hair and lately I’ve been thinking about trying out this product. I rarely straighten out my hair so I thought “oh, well, how damaging could it be”. I’ve spent 2 hours looking for a fair review on this product and surprise-surprise, except for yours, I barely found any. I’m rly sorry for what it did to your and every other’s hair. Thank you once again for saving us. Yes!!! Nobody is reviewing it.. What’s that all about?? I agree but since i added mine i have since seen quite a few and the people who used it have all complained to Schwarzkof and were all given complimentary products. My hair is just getting back to a good condition now 6 months down the line but its six inches shorter due to having it trimmed every 6 weeks and not dying it since although I still have tufty bits near my scalp where it snapped. Trust me its not worth it, if you want your curly hair straight have a hairdresser use straightners you will get the effect without the damage. I still cant beleive it hasnt been taken off the shelves!! 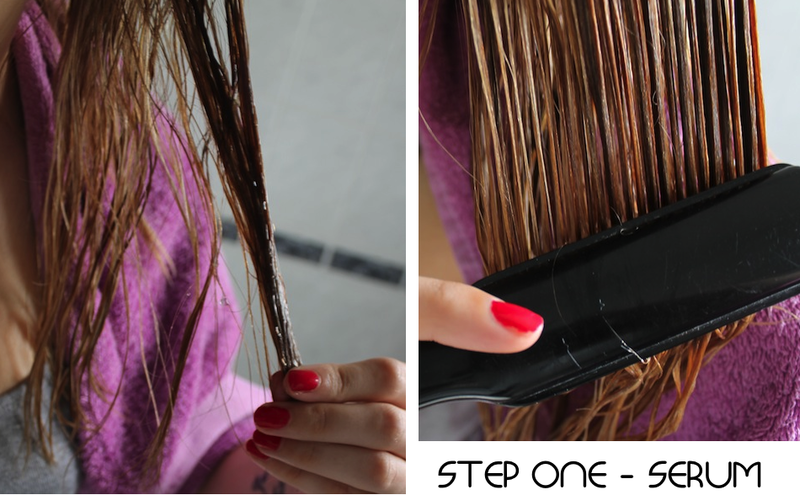 absolutely not worth ruining your hair over! i hope you wont mind me using your comment in a video i have planned warning people about this product, thanks for sharing! literally had the box here ready to use it before i read this! Just applied this product and my hair has MELTED. It’s taken me 2 years to grow my hair to a length I’m happy with and right now I don’t even want to leave my house. I left the serum on for about 10 mins and my hair was very ‘elasticy’ so I decided to rinse it off straight away. My drain clogged up with all the hair that broke off. I’ve gone from having healthy wavy hair to an extremely brittle afro, I’ve left it to dry naturally but I can’t even touch my hair now as loads are still breaking. This product needs to be taken off the counters ASAP and more people need to leave reviews on the Boots website to make customers aware. This stuff is absolute poison to hair and should be banned, how are they still selling it, I haven’t seen one review from anyone who actually likes it. It works like a delapatory cream and just melts hair. Maybe they should be reported to consumer rights or watchdog then they might actually remove the product and/or adequately compensate anyone who has used it instead of fobbing them off with hair repair products. yes!! it smells exactly like immac used to (or veet as it’s called now) awful! Thank you for shining the light on this product. This is horrible! ohh l put 1 smoothing serum destroy my hair ..so lucky l didn’t put number 2 saling cream……=( l so lucky l saw this post…=( l nearly died when l saw your hair…my hair is soooooooooooooooooooooooooooooooooooo burning my scalp and so hard to comb…l had to put lots of oil to comb it through…. Try drenching your hair in organic extra virgin coconut oil, wrap it in a towel and leave it there as long as you can before washing and deep conditioning for half an hour. This really helps. You could also take some high strength biotin to speed up hair growth. People responding to this review with similar experiences, please review, it will stop others buying. It should be discontinued. Thanks for reviewing this, I wont be going anywhere near it, thanks to you! Just bought this in the 99p store, saw it ages ago but thought it was a little pricey. I’m going to put it in the bin after reading this, i’ve been growing my hair for 3 years now i physically could not get it cut off due to a product like this. I’m just going to stick to straightening. I hope your hair has made a full recovery, thank you so much for the review! So sorry for your hair!This review saved my hair, though! Bought the product when I was travelling. Due to language-problems, i didn’t understand how to use it. So i googled ut, and found your review. I am NOT going to use it! I’m pretty sure my hair would be destroyed to. Thank you SO much for this! I picked up this kit in a bargain shop the other day thinking it was too good to be true and was literally just about to apply it but seeing all these comments has made me put it in the bin! I have long naturally blonde hair (it hasn’t been chemically treated before) which is annoyingly wavy at times but I can deal with that rather than having it fall off completely. Thank you so much again. Send me yours!!! I LOVE it and find it really difficult to buy how!! I LOVE this product! I have used it about 4 times. I have VERY thick, frizzy hair and this makes it noticibly smoother and sleeker! I am a brunette and have never cleached my hair so perhaps that makes a difference.? I also LOVE the brazillian blowdry treatment…. I guess everyone is different! After reading all of the comments on your post I wanted to write one of my own. I bought this product literally two hours ago for £2 at my local supermarket. As many of you I’ve also grown my hair out for quite a while and was getting sick of damaging it with the straightener so I felt relieved when I found this product(and at such a low price)! However, luckily, I always look for reviews before I use a product and I found it a bit odd that there was so few of them. I feel extremely lucky that I saw yours before giving up and using it anyway and just had to thank you so so much for testing it, although I feel really bad for your poor hair and the way you’ve suffered from this awful product. My hair is very fair and I do not even want to think about what would have happened if I had actually used it. So again, supersuper happy that I found your review and equally sad that you had your beautiful hair damaged because of a really lousy product! Oh my word I am so glad I read this before putting this stuff on my hair. I look like my head just exploded with hair at the best of times without a metric tonne of serum. I bought a couple of these in Poundland (I know, I know – but you can get some absolute bargains in there). Much like the hair dye I just used I thought a branded product would of course be great – got2b for the straightening kit and Garnier ‘Colour Naturals’ for the dye. There was nothing natural about the dye. Stunk of ammonia and was really difficult to use. Shame on me for not reading the ingredients label like I do with everything else! Thank you lovely for saving my hair!!! I used to have long, healthy hair down my back and after using this shocking home kit, it is now to my shoulders…just. I used it in October 2013, it is now almost a year later and my hair hasn’t grown. It falls off everywhere and no treatments are helping it. I have cried so much and I hate my appearance now. My confidence has completely gone and I have never regretted something so much in my life. AVOID!!!! After cutting off my long frizzy split ended hair having it cut short for the first time in my life has given me a head of healthy manageable hair but the last cut has made it kink at the front – maybe I should just make sure I get the fringe cut differently and not so layered next time and use different products. Thanks for the warning about this product you have probably saved me from a lot of hairdressing visits, embarrassment and upset. I am SO pleased this post stopped you from making the same mistake I did!! !